Baked for the whole family, our new Snackers are so delicious, you won’t believe they’re gluten free! 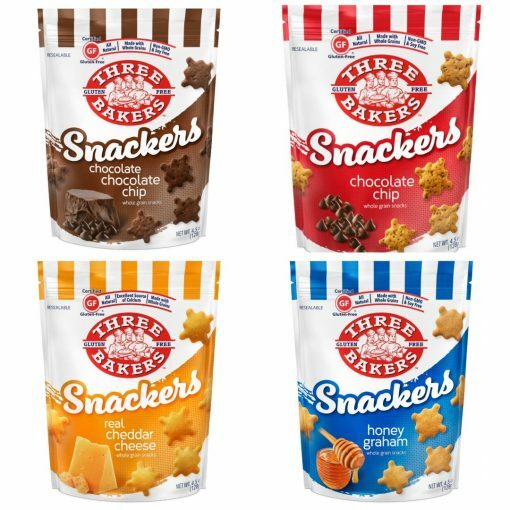 Each mixed variety case includes one package each of Real Cheddar Cheese, Chocolate Chip, Chocolate Chocolate Chip and Honey Graham Snackers. Enjoy all four of our delicious flavors in one convenient case! Compared to a similar products that are loaded with fat, calories and gluten, this healthy alternative is a satisfying choice. Each serving size of Snackers offers three heaping handfuls so they are not only nutritious and delicious, they are amazingly filling too. Plus, you’ll feel good knowing they’re also all-natural, baked with whole grains, non-GMO and soy free. At Three Bakers all of our products are baked by hand with a commitment to your health as well as your taste buds. Each crunchy bite of our delicious Snackers is packed full of flavor and is made with REAL all natural ingredients. Our Snackers are better than cookies, tastier than crackers, and have fewer calories than either. With about 22 Snackers per one ounce serving, that’s a whole lot of snacking!